This morning, Stampin’ Up! announced the list of retiring items that are DISCOUNTED! Stock up on some of your favorite items retiring AND save big! Then head on over to to my Online Store to view and to purchase HERE. As some of you might know, my daughter was a Stampin’ Up! demonstrator for 15 years, and last year she stepped away to start her own business. She’s asked me to help her to sell off all of her Stampin’ Up! supplies, so here’s the inventory! Available right now is a huge amount of stamp sets, acrylic blocks, stamp pads, markers, Big Shot accessories and punches, as well as ribbons and even completed cards and card kits! Here are your Weekly Deals! Love those In Color Blossom Accents! And don’t forget to shop the Clearance Rack. A few fabulous new items have been added. Click HERE to go to the Clearance Rack. All of your qualifying purchases through my Online Store earn you FREE card kits! August Card Shop card samples aren’t ready until mid-month, but you can begin earning your free cards right now! Simply use Host Code MXJ2MAMV when checking out to receive your free card kits. Place your order in my online store HERE. You can also just pay for your card kits if you don’t want to order. You’ll find more info on my free card kit program HERE. Tags: discounted stampin up, stampin up clearance rack, stampin up demonstrators, stampin up weekly deals, Stampin' Up! Mother’s Day is just around the corner – a few short days away – but we celebrated Mother’s Day last Saturday night by going out to dinner with our whole family to one of our favorite restaurants. I made this card for my lovely daughter and daughter-in-law, and while each mom has her own “style”, both of them are the best moms to my beautiful grandchildren! The 2014 Annual Catalog is nearing an end, and with it goes all of our gorgeous Stampin’ Up! designer series paper, like this one called Flowerpot. I’ll see if I can use a bit up and show you more things to do with your scraps before the end of the catalog on June 2nd! You know how I like circles – I think I use them on just about every card! And this one is all about circles cut with the Circles Framelits and the Big Shot. Stampin’ Up! does all the work for us by giving us beautifully coordinated pieces. All you need to do is cut a bunch of different sizes and arrange them artfully on your cardstock. The top left circle is simply Not Quite Navy cardstock run through the Big Shot with the Decorative Dots Embossing Folder just to give it another look. Don’t forget to use lots of Dimensionals – the different heights are essential to make this card really interesting! “Best mother ever” comes from And Many More stamp set – a great staple with 23 greeting stamps for all occasions. Make the sweet flower accent using the Flower Frenzy Bigz Die and the Big Shot. This die is retiring and available only while supplies last AND it’s 50% off!!!! Price is marked down from $37.95 to $18.98!!! And Stampin’ Up! always has just the right accent! A Garden Green Candy Dot from the Regals Collection is all you need to set off this pretty flower. 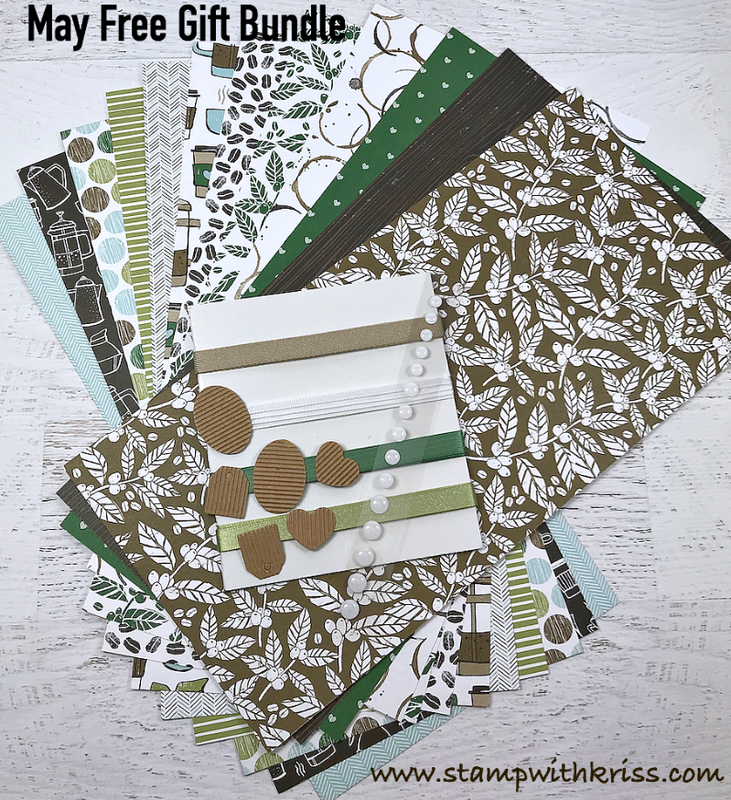 Don’t forget to line your envelope with this pretty paper – the Envelope Liner Framelits and the Big Shot make it so quick and easy! You always have the opportunity to earn FREE card kits with every purchase you make through me. Use hostess code YT373CJ3 when checking out to receive your May Card Shoppe or Stamp With Me cards completely free! Place your order in my online store HERE. You’ll find more info on my free card kit program HERE. Tags: Big Shot Projects, card ideas, discounted stampin up, Mother's Day, mothers day cards, Stampin' Up! The Weekly Deals are ready for you to order, and they’re all terrific grabs, especially the skin tone Blendabilities marked down to just $17.21! Click HERE to begin your Weekly Deal order! For the first time ever, Stampin’ Up! is lowering the price of our 3 month prepaid subscription. During Sale-A-Bration (January 6-March 31) you can save money and instantly qualify for a FREE product! You’ll save $5 on your subscription, AND you’ll qualify to choose FREE Sale-A-Bration gift! Use Item No. 137859 on your online order to purchase this subscription, or email me that you’d like to take advantage of this great sale! 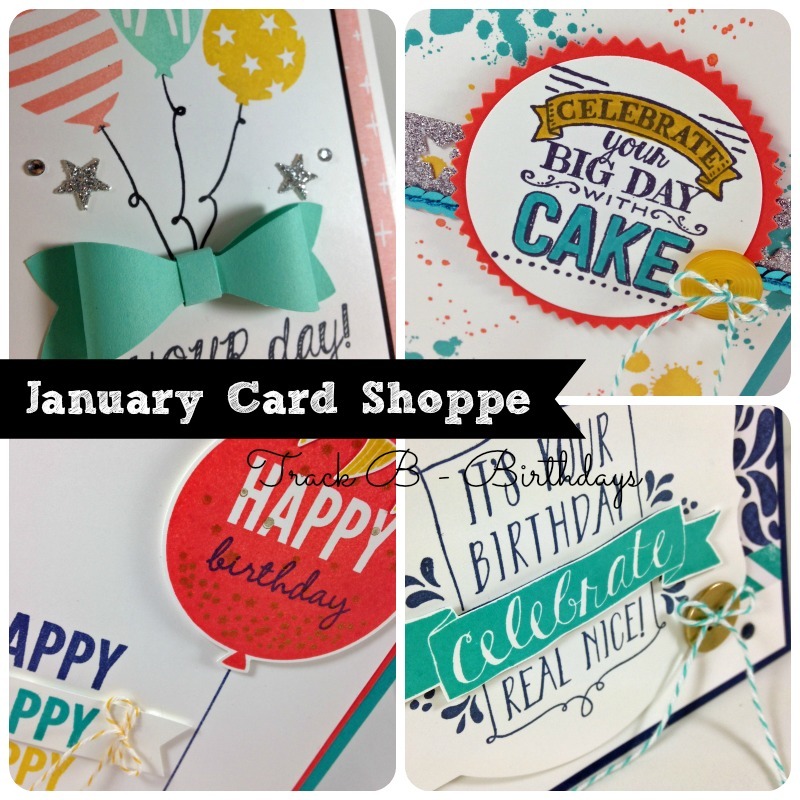 The samples for the January Stamp Shoppe Kits are now ready! And just like in December, you can choose one track for birthday cards or one track for love and Valentine’s Day – or choose both sets! Stamp Shoppe is a monthly kit where you SHOP for your favorite Stampin’ Up! products, use an ordering code, and get the featured kits for FREE! You also have the option to purchase just the kits if you don’t want to place an order. To place a qualifying order to receive your card kits FREE, click HERE to go to my online store and add Workshop Code 6Q6YV742 into your Shopping Cart. You’ll find the place to enter it in the lower left-hand corner of the Shopping Cart (not at checkout, just the Shopping Cart). Orders placed without this code WILL NOT qualify for the free kits, so don’t forget! Here’s a look at Track A Cards for January. Track A is all about love and Valentine’s Day! Here’s a look at Track B Cards for January. “B” is for Birthday in January! 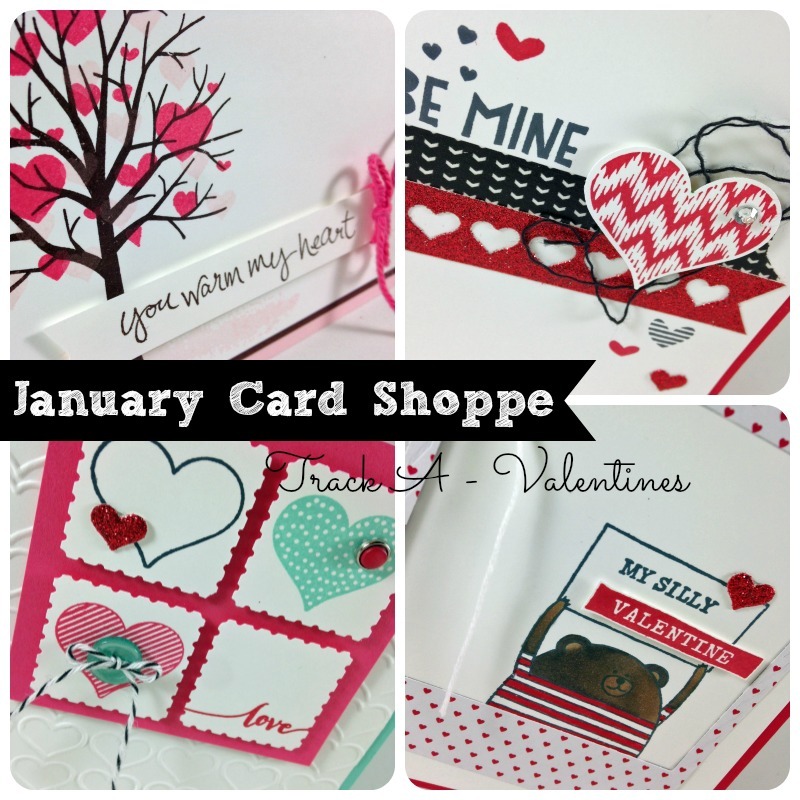 Click HERE for more information on free January Stamp Shoppe cards. From May 31 through June 30 take 25% off three of the most popular greeting stamp sets – no limit! Grab your greeting sets and all your favorite new products at my Online Store at www.stampwithkriss.stampinup.net. Tags: discounted stampin up, greetings, save on stampin up, stampin up blogs, stampin up demonstrators, stampin up specials, Stampin' Up!